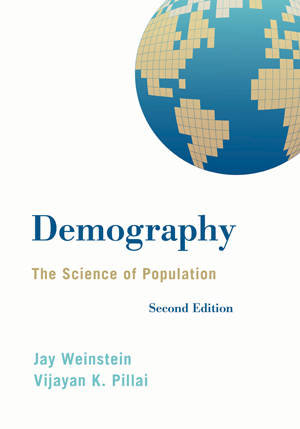 Welcome to the Companion Website for Demography: The Science of Population, Second Edition by Jay Weinstein and Vijayan K. Pillai. The most applied book on the market, Demography: The Science of Population teaches students how to use the multitude of demographic resources available to them as consumers of data. Using case studies throughout to illustrate key concepts in a realistic and concrete manner, the authors also draw examples from recent U.S. Census data, United Nations and World Bank reports, tables from the National Center for Health Statistics, and other U.S. state- and county-level sources. This open-access Companion Website is designed to reinforce the concepts covered in Demography: The Science of Population, Second Edition. Students can review and enhance their understanding of each chapter using the interactive Flashcards, self-graded Quizzes, and Additional Resources. A full range of teaching materials accompany this text, including an instructor’s manual, test bank, Respondus testing software, and line art slides. Instructor ancillaries are password-protected. For access to the teaching materials, please visit Demography and Sign in if you are a registered user. First-time users should Register then email us at textbooks@rowman.com.